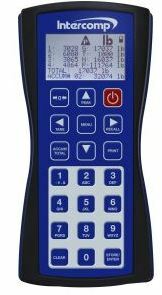 Intercomp Scales continues its history of continuous innovation and product improvement with the latest update to their HH400™ Handheld Indicator. Previously known as the TL-RFX™ Indicator, it was the go-to choice for Intercomp’s TL™ Series Tension Link Scales. Now with added features such as output to RFX™ enabled wireless printers, memory storage, and RS232 output, the HH400™ Handheld Indicator available from Central Carolina Scale is ideal for monitoring and controlling CS™ and TL™ Series Crane and Tension Link Scales, as well as PT™ and LP™ Portable Wheel Load Scales from up to 300′ (90m). With three display modes, it allows simultaneous viewing of data from up to four scales from a large, graphic display in an IP65 ergonomically designed housing. These state-of-the-industry features make this NTEP certified indicator an ideal solution for any weighing application requiring remote monitoring and control of up to four scales. Additionally, an industry standard for wireless weight monitoring, Intercomp’s “Handheld Weighing Indicator,” has also been renamed the HH60™ Handheld Indicator. A proven indicator for applications requiring the monitoring of up to six scales, it also features memory storage with a RS232 port for data transfer, is capable of controlling scale functions remotely, and is NTEP certified providing users a choice between handheld wireless indicators. Other wireless indicator options available from Intercomp include IntercompWeigh™ Software, PT20™ self-enclosed CPU, and apps to control and monitor scales from iPhone®, iPod® and iPad®. Intercomp Company is an ISO 9001:2008 registered weighing and measurement solutions manufacturer based out of Minneapolis, Minnesota with offices in the United States and the United Kingdom, proudly serving the Industrial, Racing, ITS/Enforcement, Aviation, Military, Agriculture, and Mining and Aggregate industries worldwide. Central Carolina Scale, Inc located in Sanford, NC has been in business over three decades and its employees have over 90 years of combined experience in weighing equipment sales and service but even with all that experience, the staff still trains regularly via both on the job training and factory supplied training. This one of the reasons why Central Carolina Scale has firmly established itself as a leader in the scale industry. feature that automatically adjusts the display for optimal viewing in any lighting condition. With the LaserLight M-Series messaging remote display, you can easily slide, scroll or flash any alphanumeric message. Perfect for showing important information, displaying instructions, or any general greeting, the M-Series is available with an 8 character or 12 character display. Emitted light enhances maximum viewing distance from 70˚ vertical axis and 140˚ horizontal axis. All models come with annunciators for GR, NT, lb, and kg. For added convenience, optional time and date, and temperature functions are also available. The light gray, heat resistant enclosure is smartly designed with a sloped top to ensure moisture run-off. Conveniently located setup and navigation switches allow for easy configuration of the unit. To simplify installation and make retrofitting an attractive option, the Auto Learn mode identifies the communications format and data rate used by your weight indicator to make installation quick and easy. The SURVIVOR® LaserLight remote display… providing crisp, accurate weight readings to ensure your process is always moving forward. Every now and then we read about a few concerns in the industry regarding things like short weights, customers not being able to see scale indication, customer not being allowed to leave their vehicle to see the scale indicator or companies not allowing customers in the back room or warehouse to witness the weighing or measuring operation.These are important concerns when it comes to selling or buying items by the pound. Fortunately, there is a pretty easy solution for these issues and it is called a remote display. The remote display which is sometimes called a scoreboard too, is really just a big display that you mount in clear view so everyone can see it. The display basically shows whatever weight the digital weighing indicator is showing. The XR Series remote displays from Avery Weigh-Tronix offer a choice of four numeric displays with 2 inch, 4.5 inch or 6.5 inch digits and two alphanumeric displays with 3.5 inch or 4 inch digits. The high intensity (Precision Optical Performance) red LED lamps create a display that is clearly visible in all indoor or outdoor light conditions including direct sunlight. The advanced Auto-Learn technology allows simple plug-and-play operation with virtually any indicator or PC. A durable, weather-tight enclosure protects the XR Series in harsh environments. Standard features include six digits, four annunciators for GR (gross), NT (net), lb, kg and decimal points indication. All models are ready for the easy to-install RF option for wireless communication. High quality display is clearly visible in any lighting condition. Ambient light sensor automatically adjusts display brightness for night and day. Highly efficient LEDs virtually never need replacement and lower energy costs. Connect the remote to virtually any instrument and it will automatically learn the data string and communicate, reducing set-up time. Built-in red/green traffic light on XR 4500TL (only). No need to install a separate traffic light. The electronics carriage is easy to remove and service outside of the enclosure without demounting. For units that will be viewed in rear-view or side-view mirrors. Standard feature on all units except XR 2000. Time and date will display during periods of scale inactivity. Easy to change settings or adjust time and date without opening the unit. No internal dip switches or jumper wires to mess with. The options available for this series of displays is listed below. As simple as plugging a module into the controller board inside the display and adding a base unit to the indicator. Visor provides additional level of protection against the elements. Convenient bracket system that can be attached to various pole sizes and shapes. Easy to add probe at bottom of unit for temperature sensing, which can be displayed during periods of scale inactivity. The new high intensity model GSE 1700 remote display offers versatility not available in competitive displays. You can display any type of information an application requires. The messages and weight data displayed are programmed into the weight indicator and can be configured to change as application variables change. EXAMPLE: A scrolling message is displayed “Drive on Scale”…. A truck drives on the scale and the scrolling message changes to “Move Forward Slowly” … The truck activates a photo-eye sensor and the message changes to “STOP” … The weight is displayed, recorded by the indicator and the message changes to “Weigh Complete” … Any message or weight data can be displayed for Truck Scales, Batching Systems, Tank and Vessel Weighing, Shipping and Receiving applications. RICE LAKE SURVIVOR LaserLight M Series remote display features a super-bright LED display and a non-glare filtered lens, the LaserLight M remote display is clearly visible—even in direct sunlight. The unique IntelliBright™ feature uses a photo sensor to read ambient light to automatically adjust the LaserLight’s display intensity between day and night settings. IntelliBright prevents random switching of the display brightness from headlights or lightning through a time and light intensity comparison. If you need a remote display, take a look at the Cardinal line-up. We think you’ll find several outstanding options you can use. Cardinal’s giant SB-500 remote display has a 5″ (127 mm) high weight display, with each digit consisting of up to 24 segments for greater readability. The high intensity LED is viewable in direct sunlight with a viewing angle of +/- 70 degrees. The weatherproof enclosure meets IP65 requirements and incorporates mounting tabs allowing it to be mounted on a vertical surface. The interface can autolearn most serial protocols. One custom protocol can be entered into the unit. The interface is configurable for serial data input as either an active or passive 20mA current loop, RS-232 or RS422/485, and also has the connectivity options of fiber optic and ethernet. The Cardinal SB-500 has annunciators of lb, kg, T, t, G, and N (if output from indicator). The SB-500 and SB-500M enclosure is painted mild steel, and the SB-500S comes in stainless steel. For message board capabilities, Cardinal offers the model SB-500M. SUPER BRIGHT Remote Displays are here! Seriously, this display is really nice. Featuring a super-bright LED display and a non-glare filtered lens, the LaserLight remote display is clearly visible—even in direct sunlight. The unique IntelliBright™ feature uses a photo sensor to read ambient light to automatically adjust the LaserLight’s display intensity between day and night settings. IntelliBright prevents random switching of the display brightness from headlights or lightning through a time and light intensity comparison. The LaserLight is available in 4″ and 6″ digit sizes and features annunciators for gross, net, lb, and kg.